FASTSIGNS of Chattanooga, a local sign and visual graphics provider, was recognized as a top performing center, ranking No. 1 in the FASTSIGNS network out of over 700 locations in nine countries worldwide. 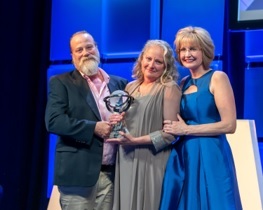 The local franchise received multiple awards at the 2019 FASTSIGNS Convention held in Orlando, Fl. -The Sales Achievement Award for Highest Volume Center, which is awarded to the top five FASTSIGNS centers in the network that achieved the highest sales volume in the U.S. and Canada between Oct. 1, 2016 and Sept. 30, 2017. -The CEO Circle Award, which recognizes the top 25 centers with the highest sales volume in the U.S. and Canada between Oct. 1, 2017 and Sept. 30, 2018. -The Profit Leader Award, which recognizes outstanding center performance. Additionally, FASTSIGNS of Chattanooga’s David Murphy received the National Outside Sales Award for the second year, which recognizes the outside sales professional who achieved the highest total sales for the year. FASTSIGNS of Chattanooga has been serving the area for over 27 years. The center is located at 3763 Powers Court and is open Monday through Friday from 8 a.m.-5 p.m.
“We are so thankful for the support from our customers and the community, and we look forward to continue helping companies of all sizes achieve their goals using comprehensive signs and visual graphics,” Mr. Bacon said.